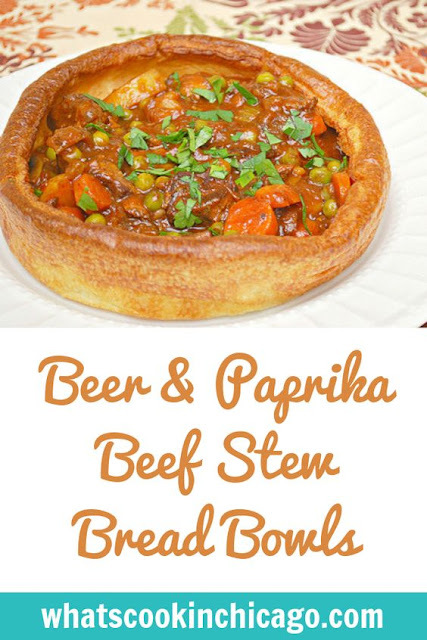 We loved this dish (although I enjoyed my beef stew sans bread bowl and with GF bread on the side instead. I used gluten free beer (Bard's brand made with sorghum malt) but you can use your favorite beer if GF is not an issue. It really lends itself to give the stew a nice complex flavor. The addition of paprika also works nicely with the flavor and adds some color too. I cooked the carrots and potatoes separately so they would retain their shape and color since the beef cooks for several hours in a slow cooker. It's a nice way of getting an aesthetically pleasing bowl of stew. In a large pot over medium high heat, add oil and butter. When hot, add half of beef and brown. Remove from pot and set inside a slow cooker; repeat with remaining beef. To the now empty pot, add diced onions, garlic and celery; cook until softened. Add beef stock, beef, Worcestershire, tomato paste, paprika, salt, pepper, and sugar. Transfer mixture to slow cooker and pour over beef. Cover and cook on low for 5-7 hours or on high for 3-5 hours. In a small saucepan, boil carrots and potatoes in water until softened. Once softened, add carrots and potatoes to the sauce pan. Add carrots, potatoes and frozen peas to slow cooker, then cover and cook for an additional 30 minutes. I truly believe breadbowls make soup taste better. Yum! Did you make the bread bowl too? 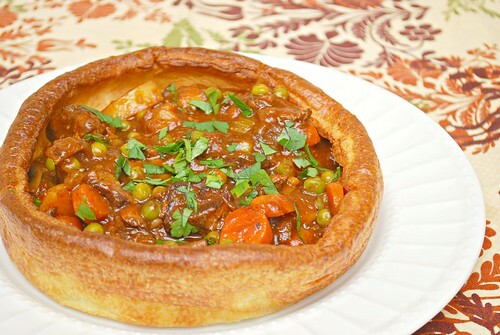 It looks like yorkshire pudding, which sounds heavenly paired with beef stew.